Remembering Charlee only compels me forward to speak up and speak out all the more for all the countless animals out there still ensnared in the animal agriculture machine. Treated as mere commodities to be used and abused, they cry and suffer in the ongoing Holocaust that is as callous as the coldest, hardest human heart on this planet. Oh, the experiences of true friendship and unconditional love of which your life is most certainly lacking. A very cherished friend of mine passed away today. Many of you, I'm sure, would be tempted to quickly dismiss her and others like her as forgettable underlings, mere food objects. That shows how much you are missing and how much you have yet to understand. Oh, the experiences of true friendship and unconditional love of which your life is most certainly lacking. Charlee was special, as all turkeys are, as all animal beings are; each their own unique individual person. Charlee filled our sanctuary to the brim with her larger-than-life personality and her full spectrum of emotions, her changing moods, her addiction to grapes (which often translated to finding her waiting at the frig door) and her fondness for her very favorite people. When she chose to bestow upon you the gift of her love, her friendship, she did not hesitate to share...and with great abundance! Charlee would gently lay her head upon your shoulder as you softly stroked her head and neck and she would relax up against you, softly purring her sweet sounds. When I would make the mistake of wearing certain pairs of tie-dyed pants, the patterns of which were apparently to her disliking, Charlee did not hesitate to let me know of her displeasure as she would holler out and peck at my offending fashion choices. I remember once, during a sanctuary tour open to the public which I was leading, when Charlee was so annoyed by my bell-bottomed patterned pants, that I had to climb up the pigs' fence to get out of her reach! LOL! 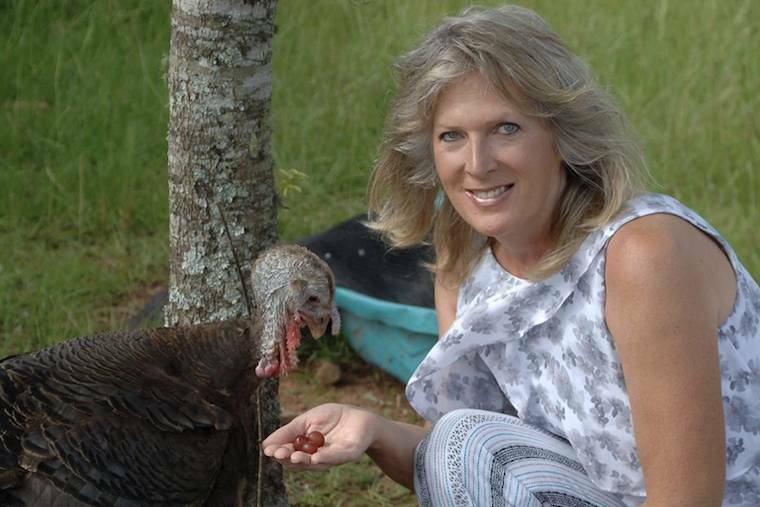 Most turkeys, tragically, never have the opportunity to know what it's like to have a true human friend or to live out their lives beyond childhood, to know the beauty of experiencing their lives in peace with their families, free from exploitation, enslavement and violent, premature deaths at the cold hands of a bloody slaughterhouse. That is beyond sad. I'm so very glad that our Charlee, and all of our rescued animals here at Full Circle Farm Sanctuary DO discover that they, indeed, do have caring people advocating for them, willing to put their compassion into all-important ACTION on their behalf; willing to save their lives and help heal their hurts. I won't ever forget Charlee and all of her special quirks and personality hues. She'll never leave my heart. I'm crying now but still it's better I had the privilege of knowing and loving her. I'm beyond glad that we had the honor of being the ones to provide her with a full life where she was allowed to simply be herself. Isn't that really what we ALL want, after all? Won't you consider becoming a part of Compassion's solution by leaving all the suffering behind and joining hands and hearts with the groundswell of caring people choosing to devote their lives to ushering in a new paradigm based upon an expanded Circle of Compassion that embraces the innate worth, dignity and personhood of ALL sentient beings? In honor of our beloved Charlee, gone but never forgotten, won't you join us here at Full Circle Farm Sanctuary as we are daily making the world a brighter place for ever more beautiful souls who deserve the very best we have to give. We have room for you here to help us help the animals. Come volunteer, give of your time and your talents, sponsor an animal, donate financially, become a sanctuary member, attend one of our classes or events. Most importantly, GO VEGAN and feel that beautiful feeling. The feeling of knowing that you are turning away from being complicit in the senseless suffering and violence so that others may simply live out their lives in peace. Feel how freeing it is to your heart, your conscience, to choose to no longer be a part of needlessly contributing to horrific suffering and violent, premature death. I believe in you. YOU CAN make a difference. You CAN change your life and, in the process, transform countless lives beyond what you can imagine. Charlee learned to believe in people too. Her world transformed the day we welcomed her in through our open gates. In the process she touched so many lives and transformed each of us as well. Rescuing lives is a process that goes "full circle." It leaves you pondering: just who rescued whom? I've long since learned that the rescuer becomes the rescuee and vice versa. We are all interwined perfectly and wondrously when we allow our hearts to lead us. Please allow your heart to stir you towards compassion. Please go vegan and stay vegan for the sake of all those who so desperately need you to take action for them. Do it to help heal and preserve the earth as well. For social justice. To revitalize your own health and well-being. To help solve world hunger. When you give, you receive. And speak up for, and take action on behalf of, animals everywhere who absolutely rely upon each of us to do so in order that they may know what it is to be loved and respected. Sow the seeds of ethical veganism wherever you may go. I miss you, sweet, sweet Charlee girl. Sleep peacefully. Love never dies, my dearest, cherished friend....but you already know that, of course.